Almond flavoured e liquid offers a smooth exotic almond flavour vape with a good throat hit and plenty of thick aromatic vapour. This slightly sweet almond e liquid has both a slight sweetness and bitter nuttiness that reflects the almond flavour brilliantly. Almond eliquid is made in UK by The Vape Shop using USP pharmaceutical and natural ingredients. What Is Almond E Juice Like To Vape? A smack of nutty goodness fills your whole mouth up with succulent slightly bitter-sweet almond that's been roasted just right. It's not sickly and repeats it's full flavour on the exhale giving you a smooth roasted almond taste and aroma. While almonds are not everybody's cup of tea, if you do like them your in for a real treat. It's almost got a creamy smooth sensation that accentuates the almond perfecty. At The Vape Shop all our e liquid’s, including Almond flavoured e liquid, DO NOT contain:- Diacetyl, Acetoin, or Acetyl Propionyl, refined sugars, protein, genetically modified ingredients, animal ingredients of any kind, preservatives, sweeteners, or colours. 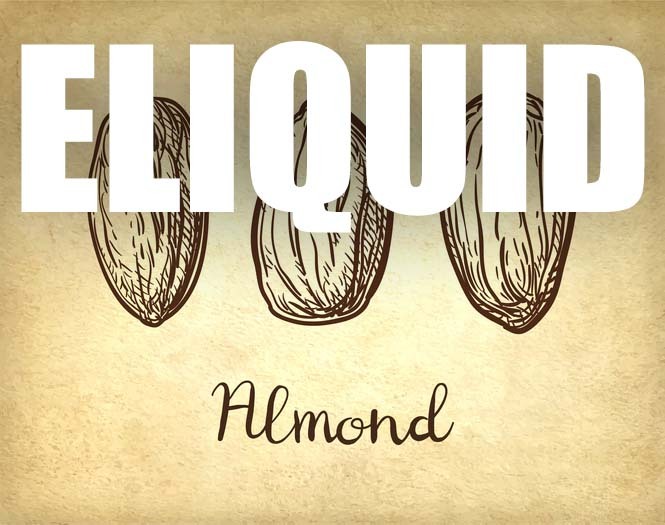 Almond e liquid is gluten and suitable for vegetarians, and vegans. You can rest assured when purchasing this e liquid flavor that it contains only the purest ingredients. Almond e liquid is safe to vape by vegetarians, vegans and as stated above does not contain any adverse chemicals found in some Almond e liquid’s.